Your iPhone contains a lot of valuable information that you don't want to lose. But at any time, due to no fault of your own, data loss can occur. You can lose the data on your iPhone through accidental deletion, virus attack, iOS ungrading to the newest iOS 12, software modifications that didn't quite go according to plan or device damage. If any of the above happens, you may want to get your data back. 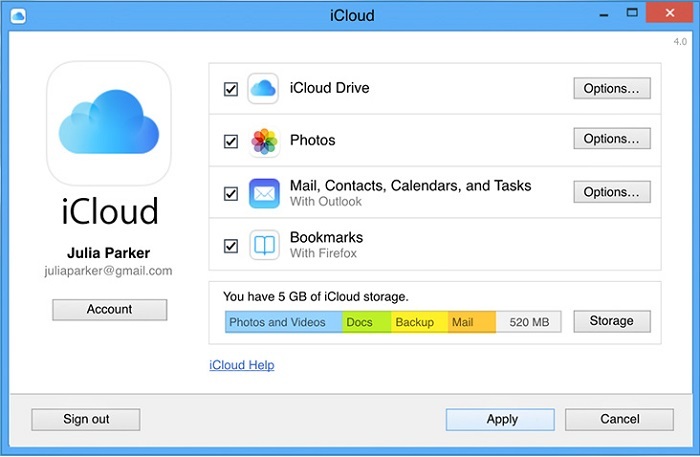 This article shows you three different ways to retrieve data from iCloud. 4 data extraction modes are provided: smart recovery, recover data without backup, extract data from iCloud or iTunes backup. 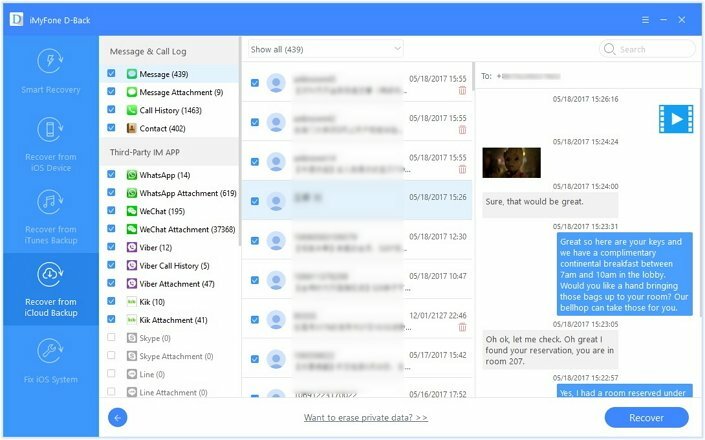 Supports more than 18 file types including messages, call logs, photos, videos, WhatsApp messages, WeChat history, voice memos and others. Supports to view data before extracting from iTunes/iCloud backups and device to let you selectively extract the data you want. Almost all iOS devices are supported such as iPhone XR/XS Max/XS/X/8/7/6s (Plus)/6 (Plus)/5s/5c/5/4s/4 running iOS 7/8/9/10/11/12. Step 1. First of all, download and install iMyFone D-back on your system. Open the program, click the 'Recover from iCloud Backup' tab, click 'Start'and Choose the iCloud backup file from which data is to be retrieved. Step 2. Now log in to your iCloud account and choose iCloud backup to download. The program will start the scanning process. Step 3. You can preview all the files or just the deleted ones by enabling 'Show only deleted files'. Now select the restore location to get back all your lost data. You could also try to retrieve data directly from device by choosing "Recover from iOS device" mode and from iTunes Backup by choosing "Recover from iTunes Backup". Just download the iCloud data recovery, iMyFone D-Back or the iMyFone's iCloud data recovery Mac version onto your computer to have a try! It is very easy to retrieve iCloud data by using iCloud.com or iCloud drive. But keep in mind that the data stored in iCloud drive remains only for 30 days so if you want to use iCloud.com to get back your data, keep this time period in your mind. Just go to iCloud.com on any browser and sign in with your Apple ID and password. Select the type of data you want to retrieve and you're good to go. You can also retrieve your valuable data including photos, videos, contacts and calendar through iCloud drive. Just click the link and get your job done. Below is the step by step guide to help you in retrieving iCloud data by using restore and reset "Erase all content and settings". Step 1: Open the "Settings" app on your iPhone. Step 2: Click on "General" and then "Reset" and choose "Erase all Contents and settings". Step 3: Flow the instructions on the Set up screen and then choose "Restore from iCloud Backup". Step 4: Sign in with your Apple ID and then select the backup file to restore the data. 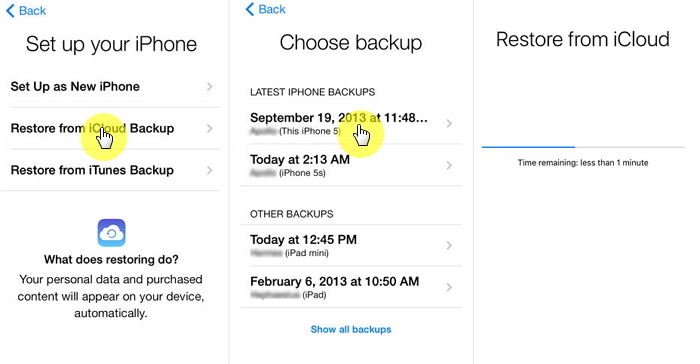 You can selectively or fully retrieve data from iCloud backup as you like. You can retrieve data from iPhone with no backups. It allows you to view first before retrieving. It allows you to retrieve data without restoring. The data stored in iCloud drive remains only for 30 days. The process is standard, easy and fairly quick. You have to physically connect your device. You will lose all your current data after restoring. You may restore the wrong iCloud backup because you cannot view all data within it. Only 5GB free storage for your backups. If you have accidently deleted your precious data or have lost it due to any reason, just consider all of the above 3 ways to retrieve your data from iCloud. From the comparison table, you can see that the option 1 is better than the other two, so we suggest you try the most helpful one to save your data, as well as your time.